Climate change is not only coming, it is coming at a rate that realizes climate scientists’ worst fears. All scientific evidence points not only to the need for action but the need for prompt action. In anticipation of the UN summit in Copenhagen to construct a new international agreement on how to fight climate change opening on December 7, Mitigating and Preparing For Climate Change – Eleven Conservation Principles for Decision Makers, from the Society for Conservation Biology (SCB), offers a set of 11 sound, science-based guidelines that will turn the world’s fight against climate change in the right direction. 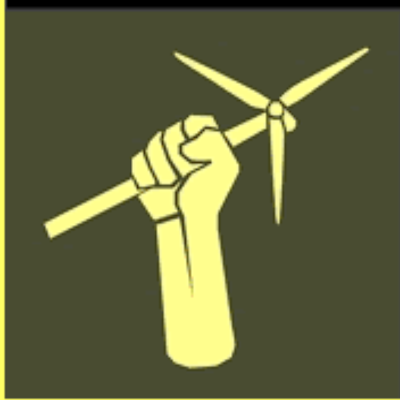 The proposal cites ample evidence of the changes already taking place and the costs that will be incurred to reverse them and demonstrates that the longer the world community waits to implement New Energy and Energy Efficiency and end the spew of emissions, the more it will cost to protect and redeem this good earth. (1) All policies, incentives and plans should aim to cut the concentration of greenhouse gas emissions (GhG) from its present ~390 parts per million (ppm) to 350 ppm as soon as possible. 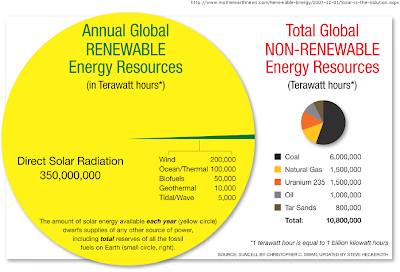 (2) Cap and cut GhGs in every human activity (like energy production, buildings and transportation) and every sector, including agriculture, animal husbandry, and forestry. 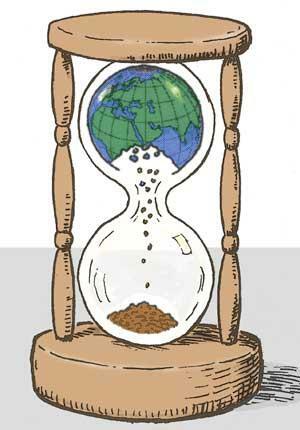 (3) Stop deforestation and restore ecosystems that have been lost. (4) Phase out everything that spews GhGs as soon as possible, starting with the dirtiest (like old coal plants). 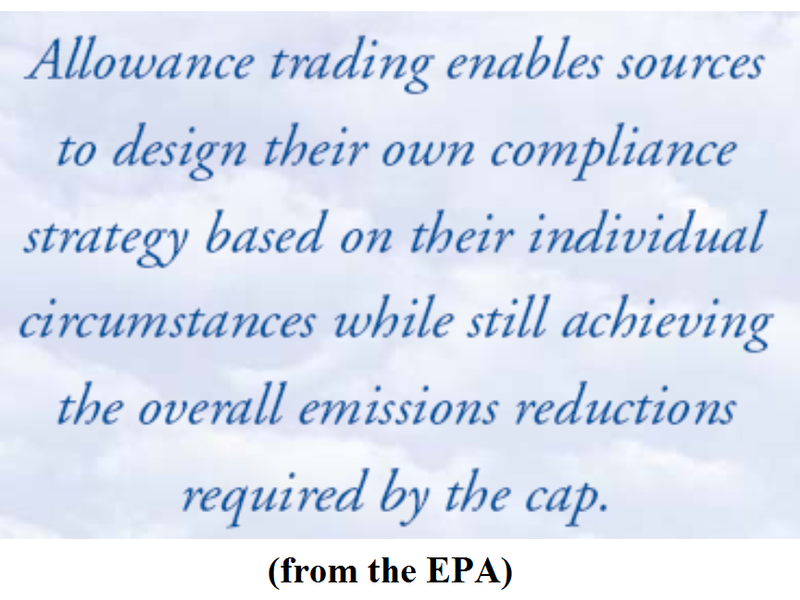 (5) Enact and ratify GhG-capping and cutting measures only after thorough study of their intended and unintended consequences. 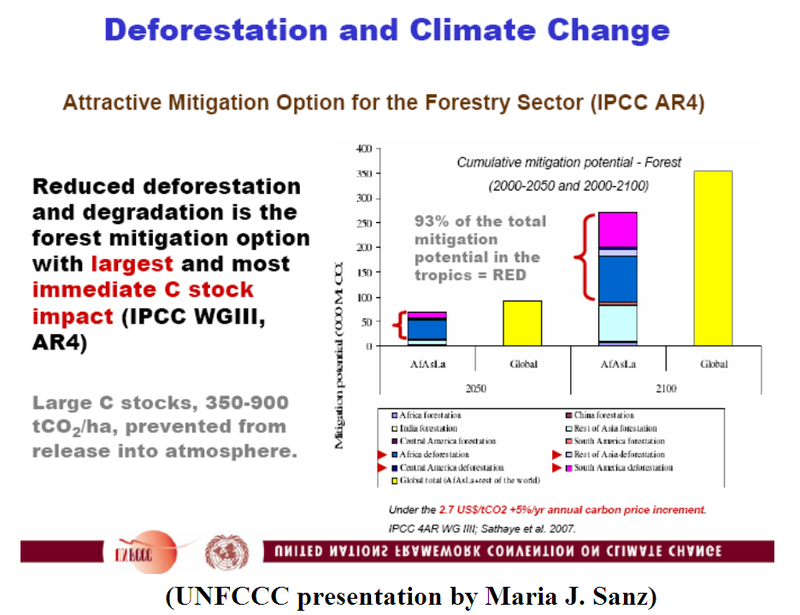 (6) Fund reforestation and wildlife habitat restoration and measure for adaptation. (7) Improve emission offset use with better science, better regulation and better enforcement. (8) Public and private investment and procurement should reflect the goal of cutting GhG concentrations to 350 ppm. (9) All caps and regulations should be applied with scientific validation and transparency. 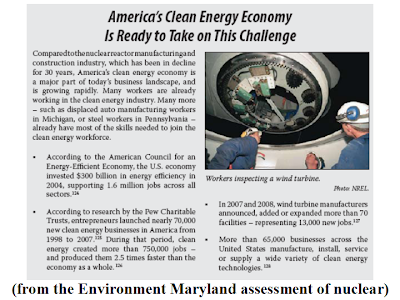 (10) Aim only for best practices to eliminate GhG spew, not compromises that protect the old ways and Old Energies. 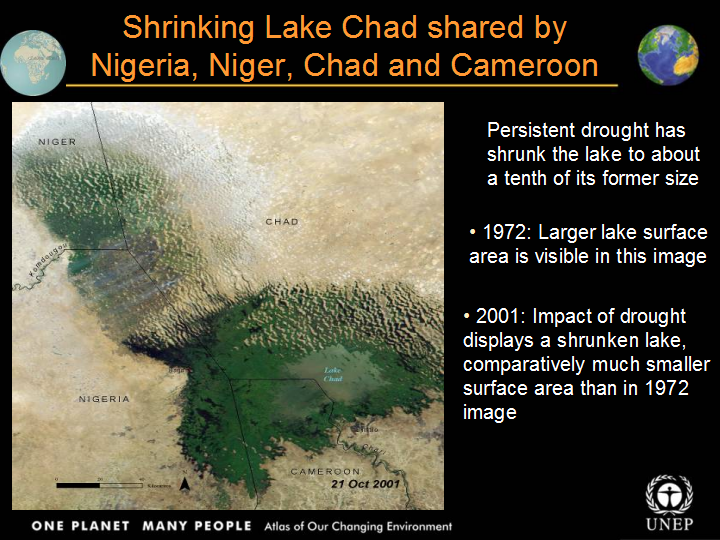 (11) Understand and prepare for climate change impacts. The report begins with a clarification. The cornerstone studies of global climate change are those from the United Nations Intergovernmental Panel on Climate Change (IPCC). 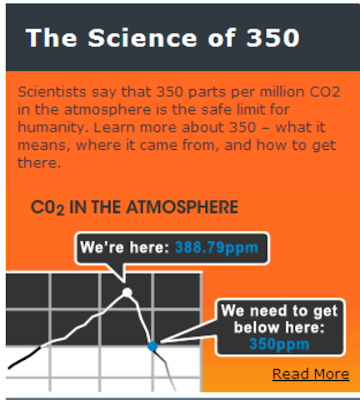 There has been a fundamental misunderstanding of the IPCC’s finding that the world must keep greenhouse gas emission (GhG) atmospheric concentrations below 450 parts per million (ppm). 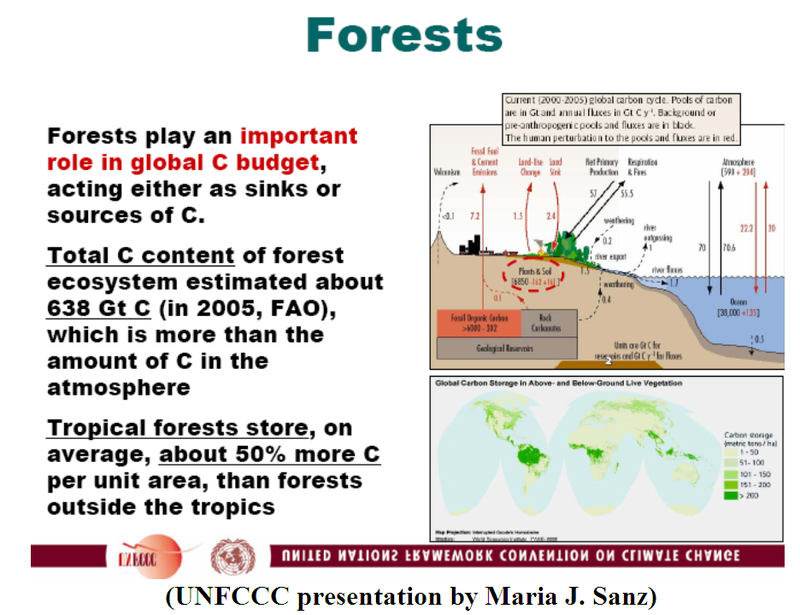 In fact, contends SCB, the IPCC said keeping them below 450 ppm would avoid the WORST impacts of climate change by keeping the global average temperature to 2 degrees centigrade but would nevertheless result in significant losses and change. (1) Ocean acidification is progressing decades faster than predicted and water so acidic it can corrode shells is appearing in increasing concentrations on the California coast. (2) Polar ice, other ice sheets and glaciers are melting at record rates. (3) Threshholds and tipping points predicted for the second half of this century (including changes in South Asian, Sahara and West Africa monsoon patterns and the climate patterns of the Amazon rainforest ecosystem) now appear years or, at best, decades away. Re Principle (1): All policies, incentives and plans should aim to cut the concentration of greenhouse gas emissions (GhG) from its present ~390 parts per million (ppm) to 350 ppm as soon as possible. Bigger, faster climate change will accelerate losses of biological diversity, changes in species’ ranges and numbers, melting of glacial and polar ice, loss of permafrost and the release of methane, ocean acidification, desertification and drought, extreme weather, flooding and forest fires. Because all these things are already happening, it is clear the present atmospheric concentration of GhGs must be reduced and ecosystems must be restored. Re Principle (2): Cap and cut GhGs in every human activity (like energy production, buildings and transportation) and every sector, including agriculture, animal husbandry, and forestry. Agriculture, animal husbandry and forestry may account for almost 40% of world GhGs. Intelligently managed pasturelands, livestock waste, croplands, fields and forests can reduce and even store emissions. Reaching the 350 ppm goal will require New Energy and Energy Efficiency on the generation side and intelligent lands management as well. Policies that support intelligent lands management: (1) Ecosystem management that maximizes biological sequestration; (2) Subsidies and incentives should drive GhG cuts and soil conservation and lands/ecosystem stewardship; and (3) all agencies that assess lands management should be required to include GhGs in the metrics by which they evaluate their policies and guidelines. Re Principle (3): Stop deforestation and restore ecosystems that have been lost. Old growth forests (300-to-800 years old) alone capture ~10% of world GhGs but are declining in both the tropics and temperate zones and, and as a result, biodiversity is in retreat. Recent droughts and higher temperature have caused some tropical forests to release more GhGs than they are sequestering. In 2005, the Amazon rainforest failed to sequester its normal 2 billion metric tons of GhGs AND released 3 billion metric tons, a net increase of 5 billion tons. 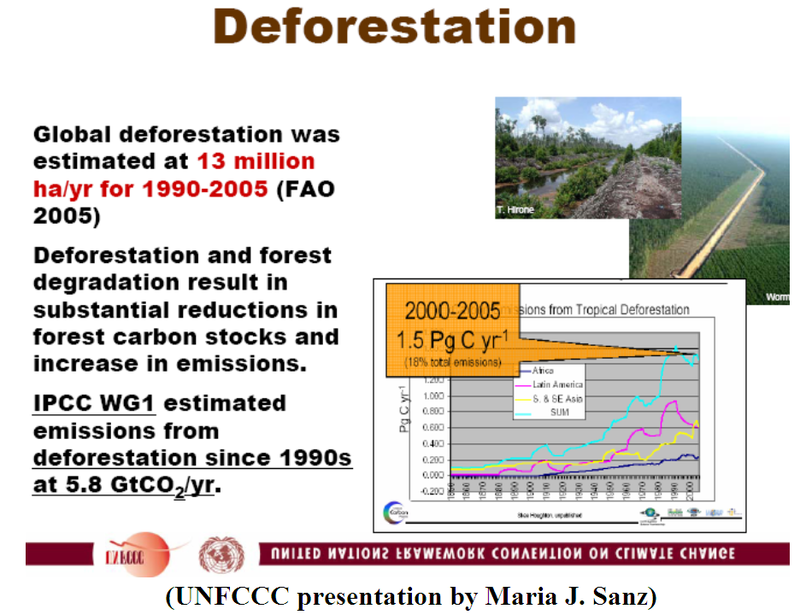 Forest growth in Costa Rica, Panama and Malaysia is demonstrably slowing. Brazilian rain forest loss seems to be resulting in diminished rainfall, slowing flows of water, reduced fish populations and livelihood loss by native peoples. 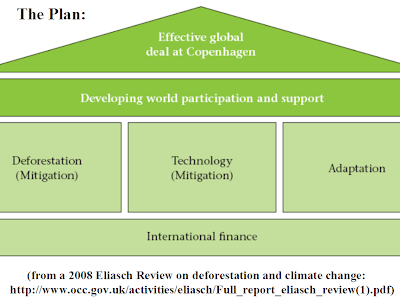 Needed policies: (1) Dial back all stresses on forests and related ecosystems (oceans, rivers, lakes and waterways); and (2) fund ecosystem restoration to maximize GhG sequestration (such as protecting old growth forests and enhancing forest biodiversity) and prevent methane release. Re Principle (4): Phase out everything that spews GhGs as soon as possible, starting with the dirtiest (like old coal plants). There are 2 ways to reduce dependence on GhG-spewing energies: (1) Institute Energy Efficiency with demand management and (2) Build New Energy. Demand management will require building Smart Grid technology and decoupling of utility profits from electricity sales. 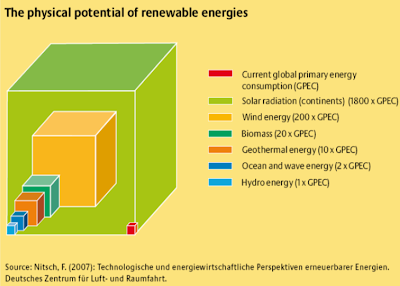 The primary long-term focus of New Energy development should be on the more-than-adequately abundant, affordable, minimally environmentally-impactful, emissions-free sources such as wind, solar, geothermal and biomass but the effort must also be aimed at short-term GhG-reductions as well. That means phasing out coal in favor of natural gas, of which there is greater capacity. To drive these transitions, the external costs and subsidies that support fossil fuels must be considered. Policies must incentivize the transition by a full life cycle cost accounting of Old Energy's environmental impacts. Re Principle (5): Enact and ratify GhG-capping and cutting measures only after thorough study of their intended and unintended consequences. Simply the enforcement of existing international conservation treaties to which most nations are already party or signatory. This alone would go a long way toward turning back global climate change. The U.S. Clean Air Act, Clean Water Act and many other foresighted environmental impact assessment and wildlife laws are examples. Bans and strict limits on products made with unsustainable methods and provisions of the General Agreement on Tariffs and Trade (GATT) are others. New laws, treaties and agreements directed at GhGs and at protecting human rights principles may also be necessary. 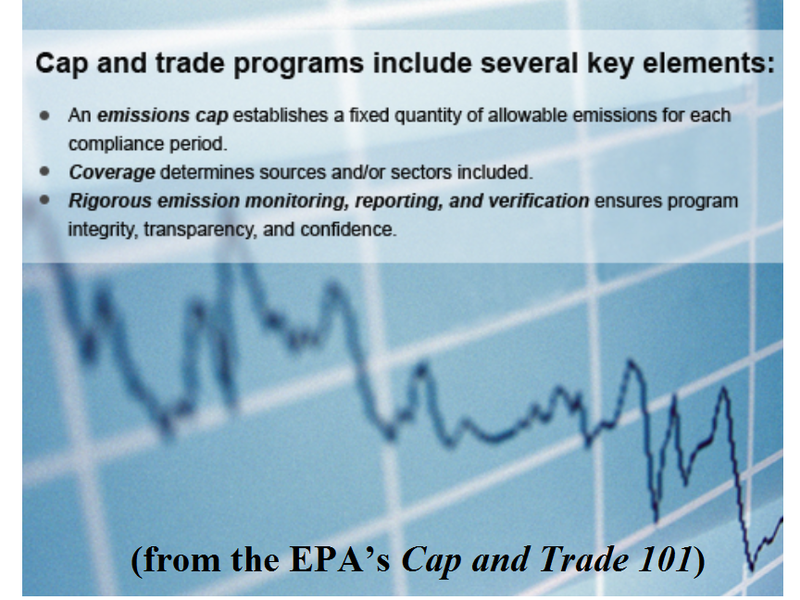 The policies that inform them should maximize the use of existing legal and financial tools for enforcement of GhG controls and elimination. Re Principle (6): Fund reforestation and wildlife habitat restoration and measure for adaptation. Part of this can be accomplished through the sale of emissions allowances and efforts of non-governmental restoration funds but concern for the world’s common ground necessitates the financial participation of all governments. In particular, developed nations have reaped the benefits of exploiting the earth’s atmosphere for 200 years and must now acknowledge the unintended consequences of their growing wealthy at others’ expense by funding reparative efforts. An international policy must include funding for the restoration of degraded ecosystems by developed nations. 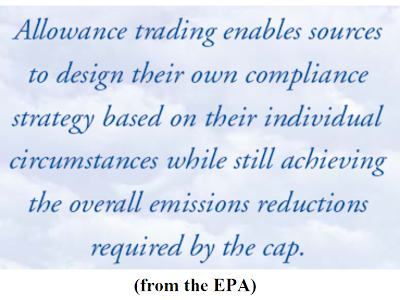 Re Principle (7): Improve emission offset use with better science, better regulation and better enforcement. 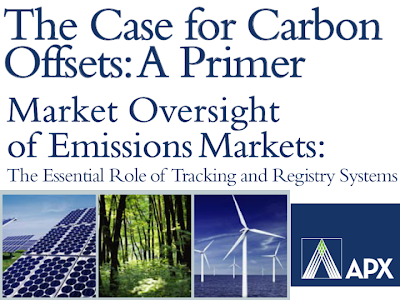 Few subjects are more controversial than that of emission offsets. The basic concept: GhGs know no borders. 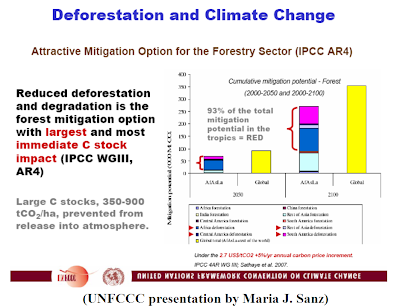 If an individual, a company or a nation is unable – because of entrenched infrastructure or practical, economic or social constraints – to cut them but can afford to pay for cuts elsewhere, such as by funding the building of New Energy or Energy Efficiency infrastructure or the protection of forests in the developing world, that is still a quantifiable GhG reduction. Problems arise because there sometimes is inadequate oversight and there can be self-involved actors. 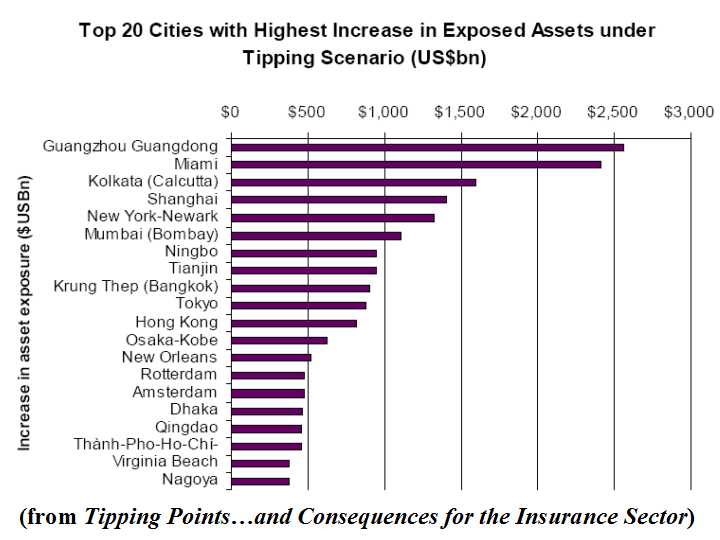 The result: Money changes hands that allows GhG-spewing to go on in one place but fails to cut GhGs in another. It might as well be a bribe. Also, funding developing world projects can have unintended consequences in the form of other environmental impacts that result, in the long-term, in worsening climate change. 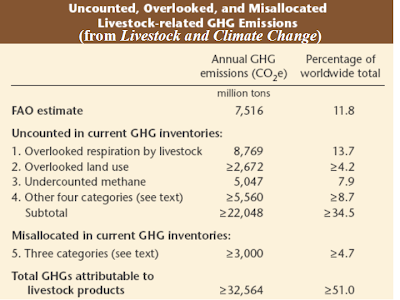 The rule on GhGs is: Eliminate them. If that’s not possible, cut them. Offset them only when the first 2 alternatives are impossible. If offsetting, make sure it is being responsibly overseen. Policies on offsetting should: (1) Avoid reliance on them as a primary GhG control; (2) Incentivize private, minor and voluntary use of offsets where there is ineffective mandatory elimination and reduction; and (3) Regulate to guarantee offset funding cuts GhGs. Re Principle (8): Public and private investment and procurement should reflect the goal of cutting GhG concentrations to 350 ppm. There is a rising movement for ethical investing that now engages several trillions of dollars in pension funds and other investments. Such stewardship is more than merely environmental because it has the potential to turn the entire international economy sustaining, restorative and nurturing. The aim of policy to support this principle should be to direct investment to measurably and verifiably ethical projects. Re Principle (9): All caps and regulations should be applied with scientific validation and transparency. Scientific validation avoids the mistake of investing in projects and sources that turn out to be climate damaging when their full life cycle costs are clarified. Transparency prevents the mistake of investing in projects and sources that turn out to do social, human and/or environmental harm. Scientific validation and transparency allow best practices to emerge and technologies that are too risky or costly to be identified. Treaties, statutes and regulations should include mechanisms that give science and transparency a sure place in evaluating compliance and success where remedies and penalties are prescribed. Existing treaties, laws and regulations should be brought in line with this principle. Independent methods of review should be built into the decision-making processes. Policies should: (1) Establish rules and systems to identify and incorporate the best science and full life cycle costs accounting; (2) Include updatable goals with a timely process that reviews advancing scientific and technological information; and (3) Applies laws and price signals in a balanced way to get the best subsidies, taxes and/or cap™ system revenues, informed resource management, regulations, and fair, rebated tariffs to fund New Energy, Energy Efficiency and ecosystem restoration. Re Principle (10): Aim only for best practices to eliminate GhG spew, not compromises that protect the old ways and Old Energies. 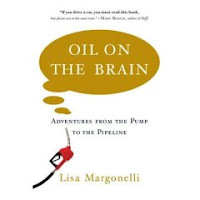 The transition to the New Energy economy will, according to an enormous and growing body of statistically validated evidence, likely bring with it the biggest economic boom of this century. 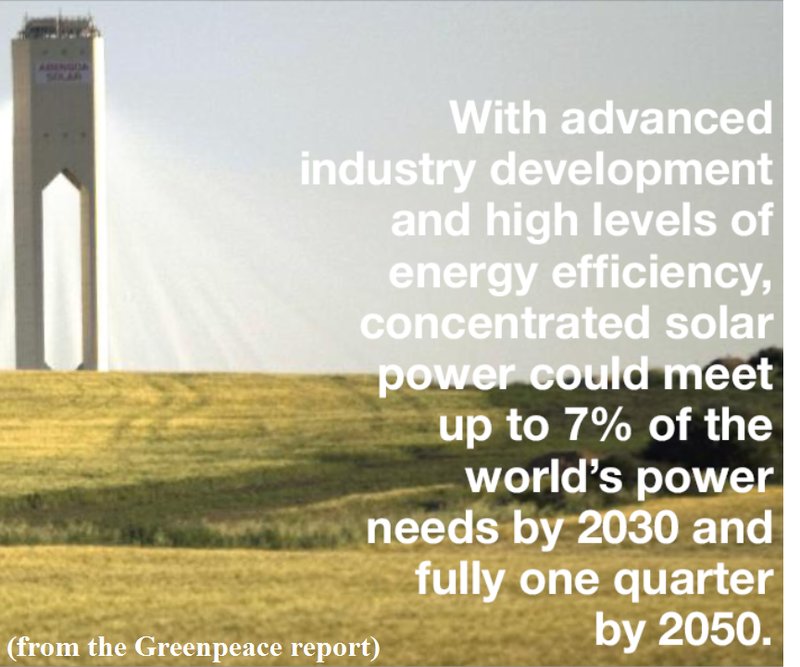 The countries that act first will reap enormous benefits and become the energy technology suppliers to the world. Those that dawdle will become energy technology-dependent. The transition will, however, require investment. The developed nations of the world must, therefore, lead the way. They can use tariffs, incentives, taxes, aid, trade, and similar tools to drive the transition. The rewards will begin with the jobs and technology that will benefit their economies, lead to the reduction of GhGs and culminate in the turning back of global climate change. The policies that will drive this transition must: (1) Create legal standards that are based on science and enforce best practices; and (2) Make ongoing effectiveness assessments of new technology and prescribe remedies when necessary. Re Principle (11): Understand and prepare for climate change impacts. Mitigation of the worst is still possible but impacts are already being felt and adaptions must take place. It begins with reducing current stressors to ecosystems and species diversity but goes much farther. The resilience of ecosystems must be maintained where possible and restored necessary. 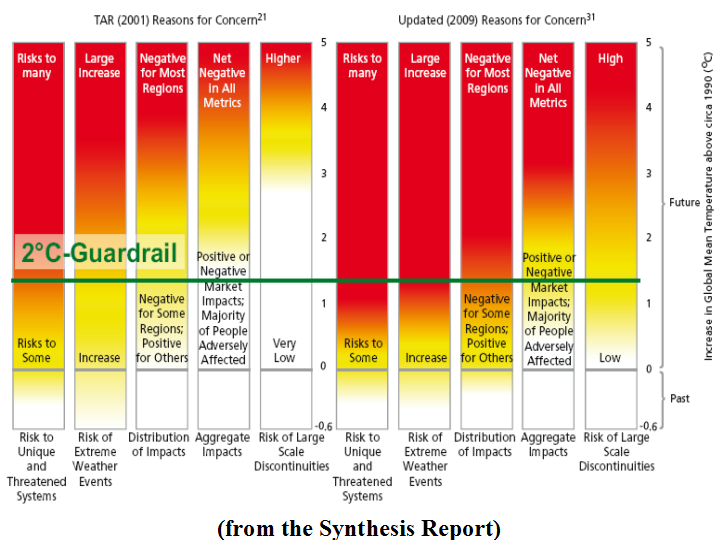 Adaptive management should put a priority on protecting water and GhG sequestration capacity. It also should aim to restore diversity because diverse ecosystems are more resilient. Large intact watersheds and road-less areas should be protected as means to alleviate ongoing droughts and intermittent floods. Ecosystems should be left intact for the benefit of surviving wildlife. 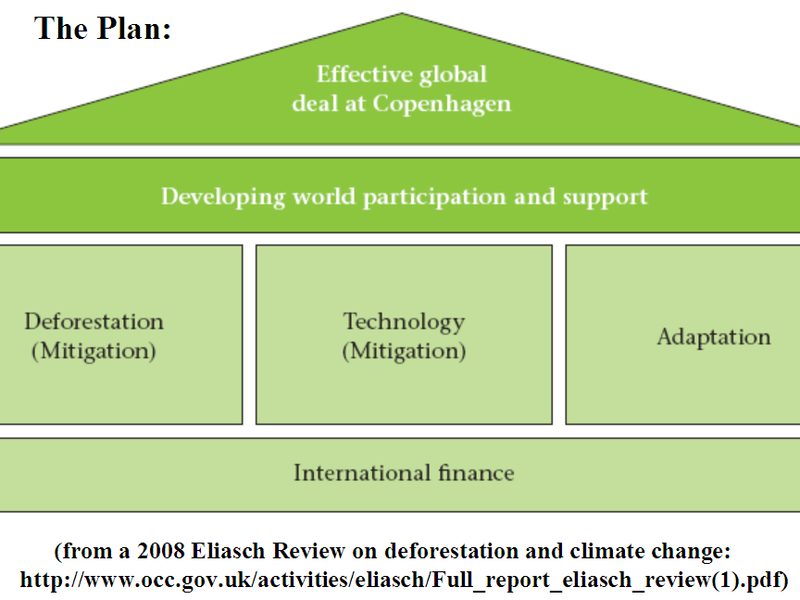 Policy can (1) Support adaptive management of both public and private lands; and (2) Integrate existing treaties, laws and plans into new climate agreements and laws. "WHAT IS THE AIM?…Carbon dioxide, produced by burning fossil fuels or through deforestation, is the main greenhouse gas that scientists say is heating up the atmosphere, causing seas to rise and greater extremes of weather…Putting a price on every tonne of carbon dioxide (CO2) produced by industry and transport or saved from being emitted by being more efficient or locking away carbon by growing trees provides a cash incentive to curb carbon pollution." 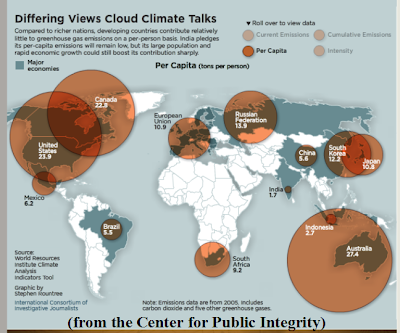 "HOW DOES IT WORK?…Carbon markets allow polluters to buy rights to emit CO2 and are often seen as more politically acceptable than carbon taxes…[A] cap is created by making it illegal to emit greenhouse gases, such as CO2, above a certain level…A government issues a limited quantity of emission permits for polluting companies or operations. 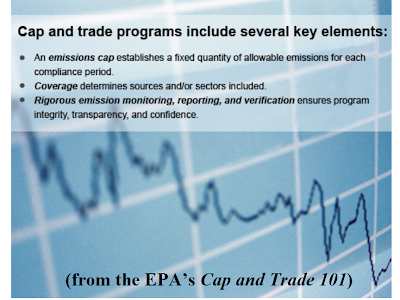 At the end of each year, firms will be required to surrender permits equivalent to their emissions. 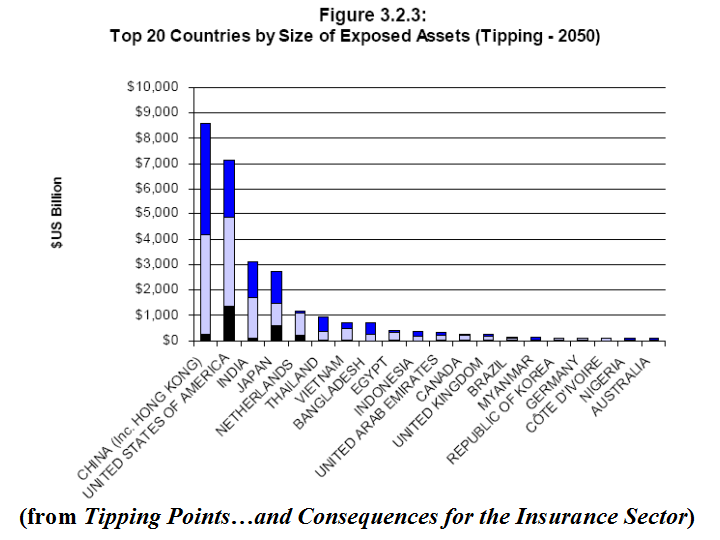 "If companies exceed their limit they can buy allowances from other polluters which stay under their cap or from a government auction…Over time the cap is toughened and the amount of permits also decreases, pushing up the carbon permit price and forcing companies to become more efficient and invest in cleaner technology…Under the U.N.'s Kyoto Protocol, 37 industrialised nations face greenhouse gas limits, creating a multi-billion dollar market in offsets from clean-energy projects in developing countries." "WHAT'S THE POTENTIAL FOR THIS MARKET? …[T]he global carbon market could be worth $2 trillion by 2020, from $125 billion last year…Europe's [Emissions Trading Scheme (ETS)] is the largest and the only domestic cap-and-trade system operating. The separate…[Kyoto Protocol/UN system] called the Clean Development Mechanism is worth about $6.5 billion. "The [ETS]…launched 2005, is mandatory for all 27 member states and covers nearly half of all EU carbon emissions…The target is to cut emissions 21 percent below 2005 levels by 2020. Member states allocate a quota of carbon emissions allowances to 11,000 industrial installations…[M]ost permits [are] free now but many electricity generators will have to pay for all these from 2013…Companies can buy carbon offsets from developing countries if that works out cheaper than cutting their own emissions…"
"A group of Grand Valley State University researchers has begun a wind energy study on the potentials and pitfalls of renewable power production in a four-county West Michigan shoreline region. 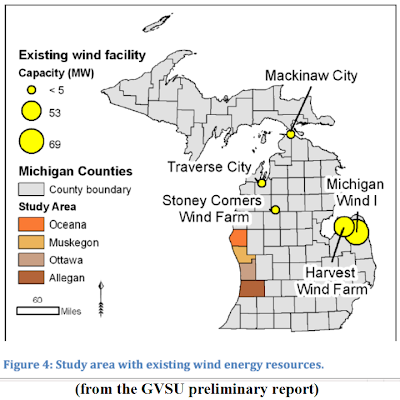 The three-year study comes on the heels of a state mandate that 10 percent of Michigan’s electrical generation must come from renewable sources by 2015." "Many township governments in the four counties — Muskegon, Oceana, Ottawa and Allegan — have responded with ordinances regulating utility-scale wind turbines. Thirty-seven of the 73 townships in the four counties have wind tower ordinances…"
"As GVSU researchers continue to work on their wind study, public opinion will begin to be collected. The study team will have workshops and public meetings throughout the region next summer…and will establish social networking outreaches through Facebook and Twitter…The next report is scheduled to be released in November 2010 and final reports in February and May 2011." A Competitive Boost For Solar Energy; With expanded production bringing down panel prices, a green energy outfitter claims price parity with grid power is near. "Houston-based Standard Renewable got 75% of its $35 million in revenue this year from installing solar systems. 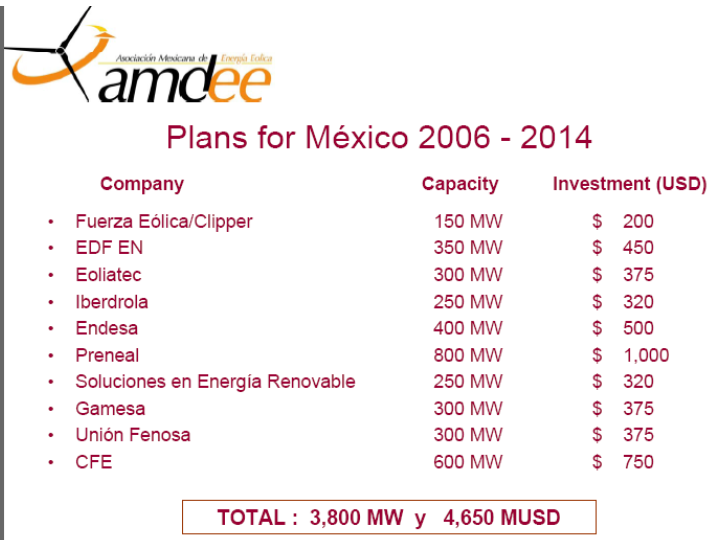 Just 10 months ago it was buying solar panels from the likes of Kyocera, BP, SunPower and First Solar for $4 per watt. Today, prices have plunged to $1.90 a watt." 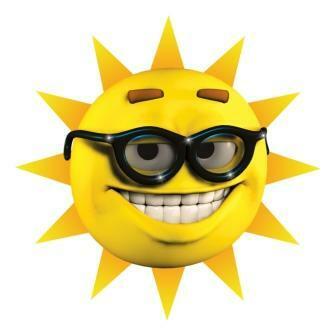 "…[F]or 31 metropolitan areas, factoring in average sunshine and cloud cover, applying the federal government's 30% investment tax credit…assuming that a homeowner can finance a system at the going mortgage rate of around 5%…[and amortized] over 20 years, the effective rate that a homeowner would pay for [solar] electricity in the New York metro area is 12.7 cents per kilowatt/hour. 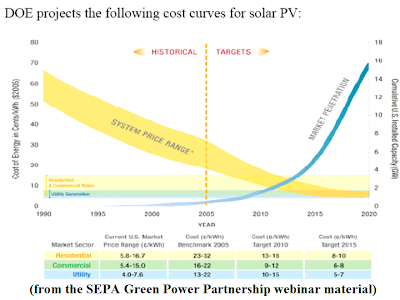 In Dallas it's 11 cents/kwh, and in Las Vegas, just 9.3 cents…The nationwide average residential electricity price is 12.05 cents…"
"…[Solar] is a distributed source of power generation…No need to build new transmission lines…[But the] average home system that Standard Renewable installs is a 3.5 kw system that will produce, on average, 4,900 kwh of electricity a year, or less than a third of the average home's electricity usage. 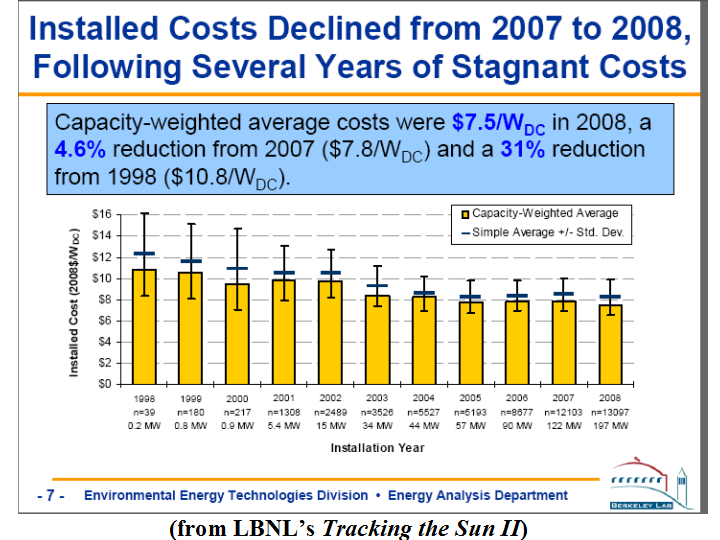 It'll cost roughly $14,000 installed…If your utility charges, say, 13 cents per kwh, the system will pay for itself in 22 years." "Action on black carbon (soot) is another priority. This aerosol is responsible for up to 25% of total climate warming, and can provide cooling in days to weeks. Reducing other short-lived climate contributors such as methane and tropospheric, or ground-level, ozone is also important. Storing carbon in soil through biochar production is another key strategy and one of the only safe carbon-negative technologies available." "Latin America has little installed wind-energy capacity even as global growth in the sector hit 30% a year at the start of the decade before slowing to 24% from 2004 to 2007…It has slowed further in recent years due to the debt crisis…[T]op wind turbine manufacturers see a recovery around the corner and an eventual boom, as governments provide incentives to meet international commitments for clean, renewable energy." 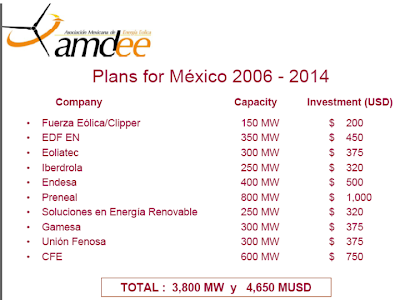 "…[P]roximity to the Gulf offers wind speed of about eight meters per second, allowing the turbines to operate around 40% of capacity…less than Oaxaca, but [adequate]…[GSEER-SOE and Siemens have] an agreement with the 43 municipalities in Tamaulipas to provide energy for government installations such as schools and hospitals…Before deciding on Siemens, [GSEER-SOE] did a series of studies on how wind turbines from the biggest global companies would perform as part of the project…Siemens' size and financial stability…helped…GSEER-SOE to obtain financing." 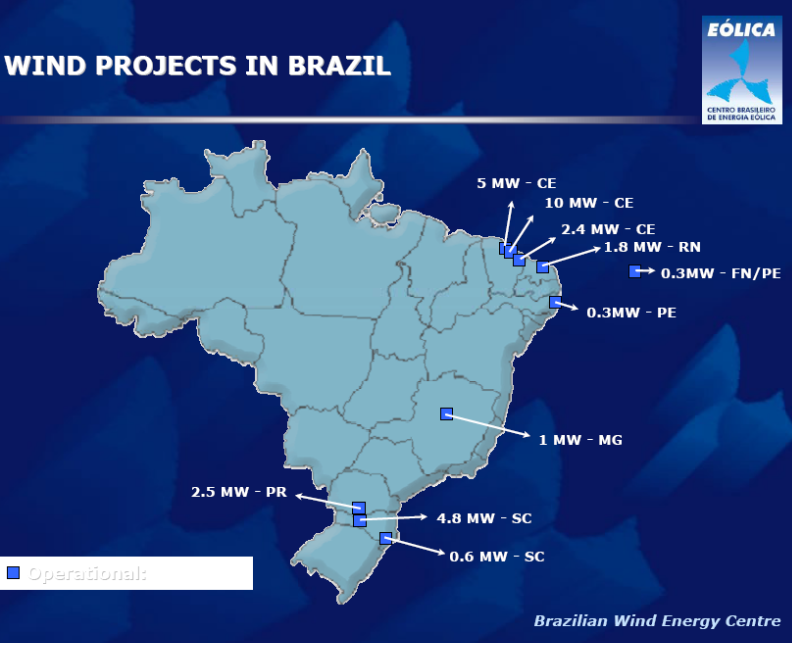 "Siemens Wind Power Americas…is preparing for an upcoming energy auction in Brazil to assign several wind projects…[and studying the market in] Chile…[with Mexico, those nations] make up the "economic engines" of Latin America…and Siemens is betting that its wind turbines will be increasingly fueling them." "Spanish renewable energy company Abengoa will team up with German utility E.ON to build two solar mirror plants in southern Spain, benefiting from E.ON's cash and large grid expertise. "E.ON will pay half of the overall investment of 550 million euros ($828 million) for the two plants, which have a capacity of 50 megawatts each, giving Seville-based Abengoa access to the finance power of the world's largest utility by sales…"
"Abengoa, which has already started building the two plants in Ecija, close to Seville, and plans to start producing power in 2011 and 2012, respectively…"
"Both companies plan to extend the partnership to further develop solar power in Spain and will study future projects on a case-by-case basis. "The plants use the sun to generate steam that powers turbines, a technology called solar-thermal as opposed to solar cells…"
"The world's first test plant to harness osmotic power, a new emission-free source of energy, opened…in Norway. Nestled amid pine-covered hills on the banks of the Oslo fjord, 60km south of the Norwegian capital, the facility will exploit the energy produced when fresh water meets seawater. "Statkraft, the Norwegian energy firm behind the test plant, says osmotic power could produce up to 1,600–1,700 terawatt hours worldwide – the equivalent of half of the energy generated in the EU today…"
"The new technology is based on the principle of osmosis, the diffusion of water through a semi-permeable membrane, which is how plants draw water from the soil…[F]resh water and salt water is guided into separate chambers, divided by an artificial membrane. 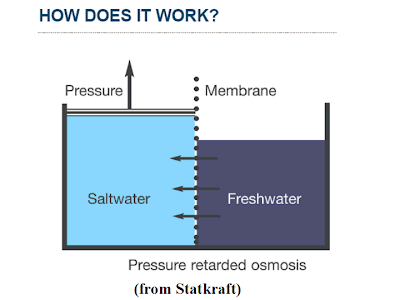 When the fresh and seawater meet on either side of the membrane, the fresh water is drawn towards the seawater. 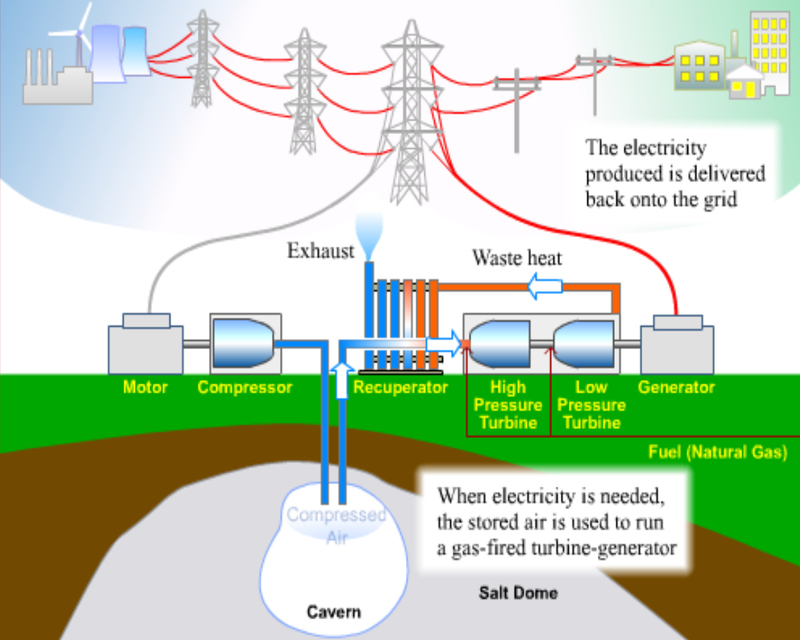 The flow puts pressure on the seawater side, and that pressure can be used to drive a turbine, producing electricity." "The two-storey, tennis-court-size [pilot] plant, situated next to a pulp mill, will generate little power…There is no river at the site…so Statkraft will use the water from a nearby lake piped by the pulp mill…The company hopes to launch the first commercial plant between 2015 and 2020 – if everything goes to plan. "The challenges are many. First is the price…[S]ince it is a new technology, osmotic power is expensive to run…Another challenge is technical. 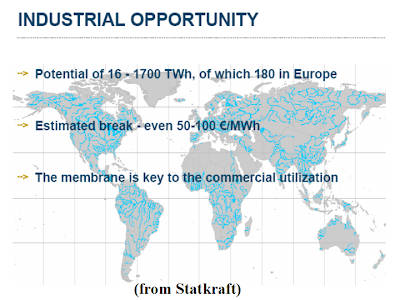 The key to the technology is the membrane, but Statkraft says it needs to be made five times more efficient than it is today. Yet another issue is developing the business, with Statkraft looking to find business partners, such as membrane manufacturers and utility companies…[Other companies and NASA are] looking into osmotic power…"
"Nigeria's most celebrated environmental campaigner is about to launch a reality TV show to highlight the dangers of global warming for Africans. "At almost 72 years of age…with three crossings of the barren wastes of the Sahara desert already behind him, Newton Jibunoh is preparing for the most ambitious desert adventure of his life…For his final trek across the desert, planned for the new year, he will be taking a band of 15 young men and women from Nigeria and neighbouring Niger with him." "After more than 40 years spent travelling the world explaining the dangers posed by global warming, and in particular the worsening problem of desertification in the Sahara region, Mr Jibunoh says his greatest concern remains the lack of awareness among Africans of the gravity of the situation…The show is his way of spreading the word to a new generation of African environmentalists… [It will] run through early December and will eventually be distributed across a wide swath of the sub-region, potentially reaching many millions of African homes…"
"Mr. Jibunoh says he knows his own time is running out…But he says that Desert Warriors is all about passing the torch to the environmental activists of tomorrow and showing young people across Africa that this is a fight worth carrying on after he is gone…"
"Drought has slashed capacity at Kenya's main dams, forcing shutdowns and leading to reliance on costly diesel-powered generators, which in turn have pushed up energy bills...East Africa's biggest economy has relied on hydro energy to provide up to 90 percent of its electricity requirements. 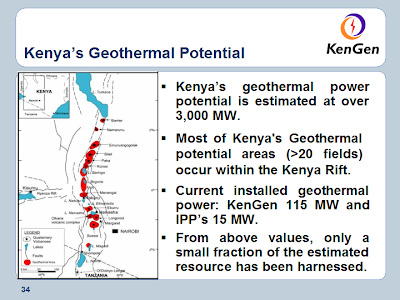 The country produces about 1,300 MW of power…[but] needs to add another 1,800 megawatts (MW) in new power generation to its grid to meet growing demand…"
"…[T]he main obstacle in investing in geothermal [is] the high costs involved…[It] costs $6.2-$6.5 million to drill a well and a well-head generator costs between $7 million and $8 million…[but] Kenya [needs] to ramp up power production to meet growing demand…"
"The country is [also] seeking to expand generation of electricity from other renewable sources. 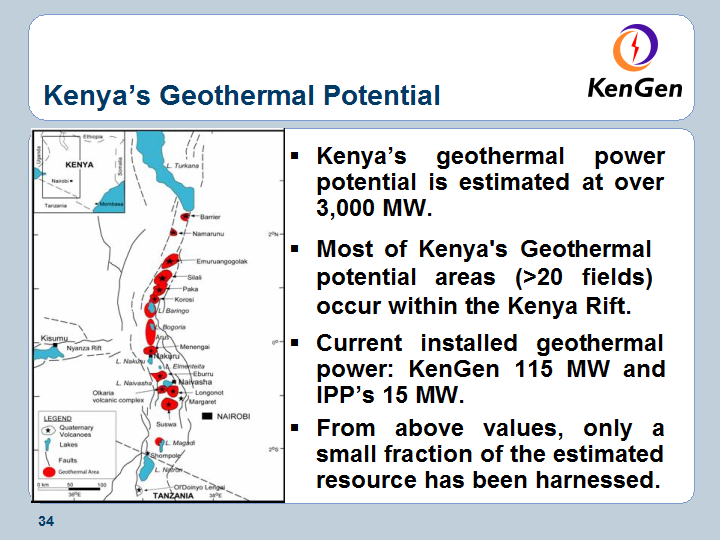 This includes a 300 MW wind farm in northeastern Kenya due to be commissioned by 2012. 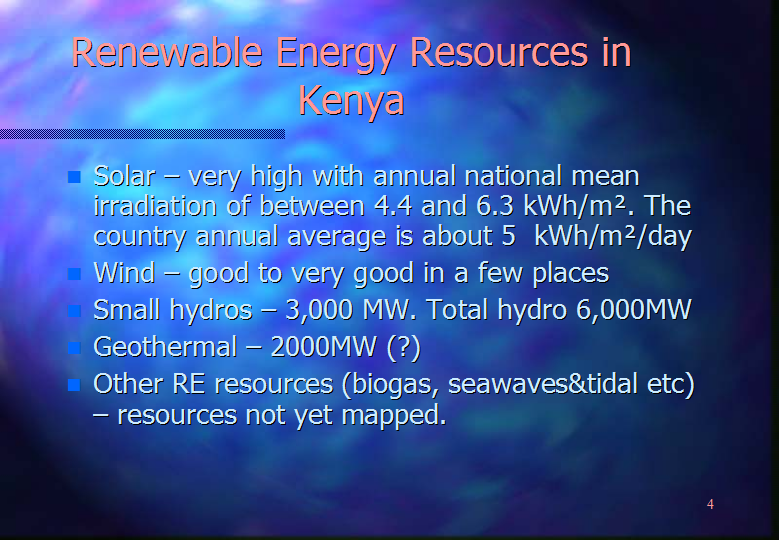 "KenGen is already setting up wind turbines to produce 5.1 MW…[with plans to increase this by another 30 MW. 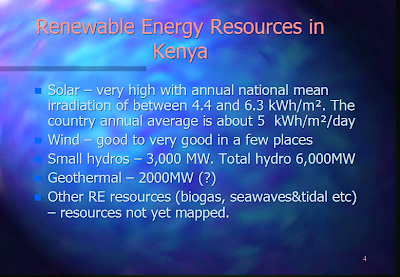 The government says wind power has the potential to produce 2,000 MW in Kenya…[Kenya] has spent 630 million shillings in Kenya's dry areas on solar power for hospitals, schools and health centres in the last four years and has set aside 500 million shillings more in the 2009/10 budget…The country also has the potential to produce more than 300 MW from sugarcane by-products, but only one sugar producing company has been feeding 23 MW to the grid." "Pledges by China and the U.S. to set numerical targets for their greenhouse-gas emissions through 2020 may improve chances for a global climate agreement at negotiations next month in Copenhagen. 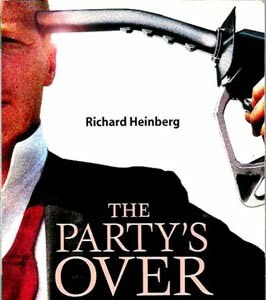 "China…[said it] will cut output of carbon dioxide per unit of gross domestic product by 40 percent to 45 percent from 2005…. [T]he U.S. said it will propose a direct CO2 reduction in the same period of about 17 percent, provided the cut lines up with a new domestic climate law…"
"The announcements mean the two biggest emitters of industrial pollutants blamed for climate change have spelled out their intentions to lower discharges, driving forward the United Nations-led [Dec. 7-18] negotiations… Yvo de Boer, the top United Nations climate official…[and the] European Commission, the EU’s executive arm, welcomed the goals while urging both nations to go further…[because neither] proposal is as strong as the EU plan to cut emissions by 20 percent from 1990 through 2020. "The U.S. move depends on Congress passing climate- protection legislation…China’s [voluntary] targets don’t mean emissions will fall, only that their growth should slow. The nation’s economy has more than quadrupled since 2000 to $4.3 trillion, and if that world’s fastest pace continues the country’s carbon pollution will also increase….China has balked in climate negotiations at taking on legally binding commitments…[as part of] a framework for an accord to replace the 1997 Kyoto Protocol, which expires in 2012…De Boer has called on all developed countries to commit to legally binding emissions reductions…[and for developing countries to] say what actions they’re taking, without defining absolute reduction targets…"
"The U.S. pledge is contingent on a deal in Copenhagen…That pledge amounts to a reduction of about 5 percent from 1990 levels. The EU has said it’ll cut emissions by 20 percent over three decades and that it’ll ramp that up to a 30 percent reduction if an ambitious global deal is reached…The White House said the U.S. intends to reduce emissions by 30 percent from 2005 levels in 2025 and a 42 percent cut by 2030. Legislation backed by Obama to cut greenhouse gases and establish a market for the trading of pollution allowances…[is] stalled in the Senate…[which is why] the UN’s de Boer [recently] said a legally binding deal won’t be possible in Copenhagen, and a political agreement must be reached that over the following year can be translated into a treaty." "…Around the world the story is the much same. Wherever nations have taken the first modest steps to stave off a looming environmental calamity for future generations, they’ve triggered a backlash from powers rooted in the economy of the past. Opponents of climate action may have different methods as they pressure different capitals, but the message is consistent: Be afraid that a cherished way of life may be lost. Be afraid that a better standard of living will never be had…"
"…It was in anticipation of Copenhagen that the leaders of the developed countries known as the Group of Eight (or G8) pledged at their July meeting in Italy to work to keep temperatures from rising more than 3.6 degrees Fahrenheit (2 degrees Celsius) over pre-industrial levels. Beyond that threshold lie grave dangers for civilization…The G8 agreed that emissions should be cut 80 percent or more below 1990 levels by 2050, in line with IPCC targets, but the world leaders declined to name any short-term goals…In fact, none of the emissions reduction targets for Copenhagen announced so far by wealthy countries meets the 25 to 40 percent below 1990 levels by 2020 that the IPCC said would be necessary to achieve stabilization…"
"The principle that developing countries shouldn’t have binding treaty obligations is dearly held by businesses that have the ear of government in those nations…Those themes are echoed by representatives of the so-called BINGOs, the Business and Industry Non-Governmental Organizations, that attend the negotiating sessions all over the world and have been a permanent presence in the United Nations’ efforts on climate change for more than 20 years. 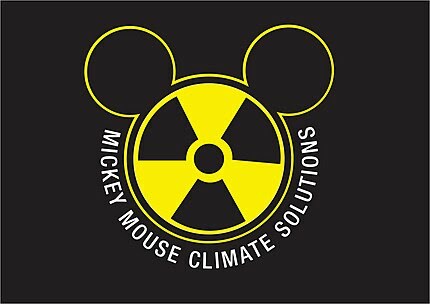 These climate uber-lobbyists aren’t there to make a hard-sell pitch, but to get to know the key players who congregate around the treaty talks, to ease their way into more specific policy discussions back home, where the real decisions are made…"
"FirstEnergy Generation Corp… has purchased the rights to develop a compressed-air electric generating plant on a 92-acre site in Norton, Ohio, from CAES Development Company, LLC. 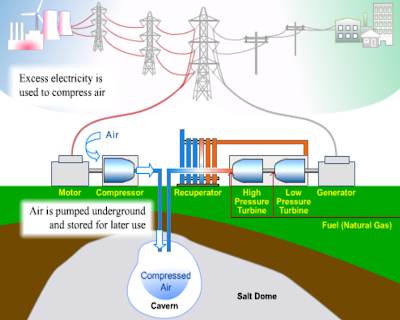 The transaction includes rights to a 600-acre underground cavern, formerly operated as a limestone mine, that is ideal for energy storage technology." "…[Compressed Air Energy Storage (CAES)] involves compressing air in an underground cavern or other chamber during the evening – when electricity demand is lower – and releasing it during the day, when the need for electricity is greater…[CAES could be key in integrating large-scale intermittent New Energies onto the nation’s grid system]…"
"…Currently, there are two commercial-scale compressed air electric generating facilities: a 110 MW plant in McIntosh, Ala., operated by PowerSouth Cooperative that began service in 1991; and a 290 MW facility in Bremen, Germany, that has been in operation since 1978. While there are other compressed-air projects under development, none is expected to be comparable in size and scope to the Norton facility…FirstEnergy [the 5th biggest investor owned electric utility in the U.S.] currently has more than 800 MW of renewable capacity…By the end of 2012…[it] could be more than 1,000 MW…"
"Duke Energy…intends to match a $22 million grant from the U.S. Department of Energy to design, build and install large-scale batteries to store wind energy at one of its wind farms in Texas. "The batteries at Duke Energy's Notrees Windpower Project…will store excess wind energy and discharge it whenever demand for electricity is highest - not just when wind turbine blades are turning." 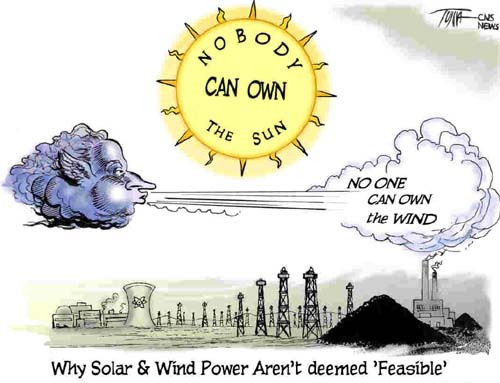 "The prevailing technology used at wind and solar farms throughout the world allows electricity to be produced only when the wind is blowing or the sun is shining. 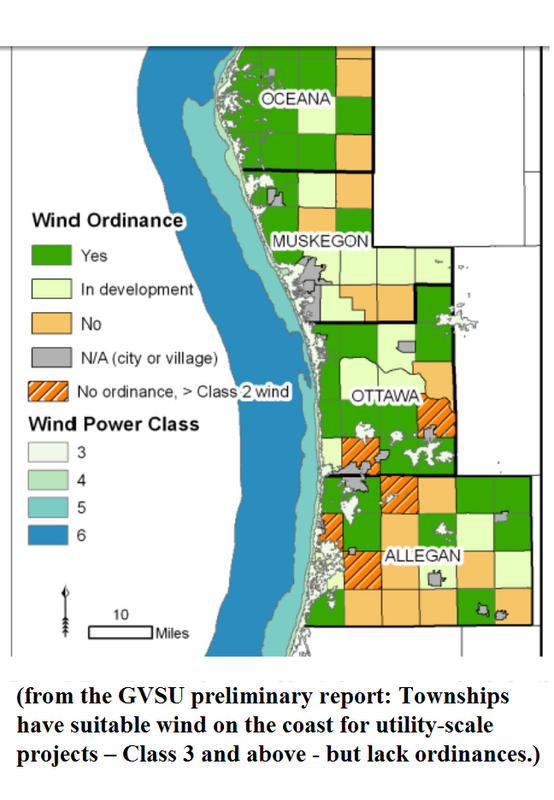 The intent of the Notrees grant is to demonstrate how energy storage can help overcome this [intermittency] issue…[and] help reduce greenhouse gas emissions…"
"This project represents one of the nation's first demonstrations of energy storage at a utility-scale wind farm. The 95 wind turbines in operation at Duke Energy's Notrees site can generate 151 megawatts (MW) of clean, renewable electricity. 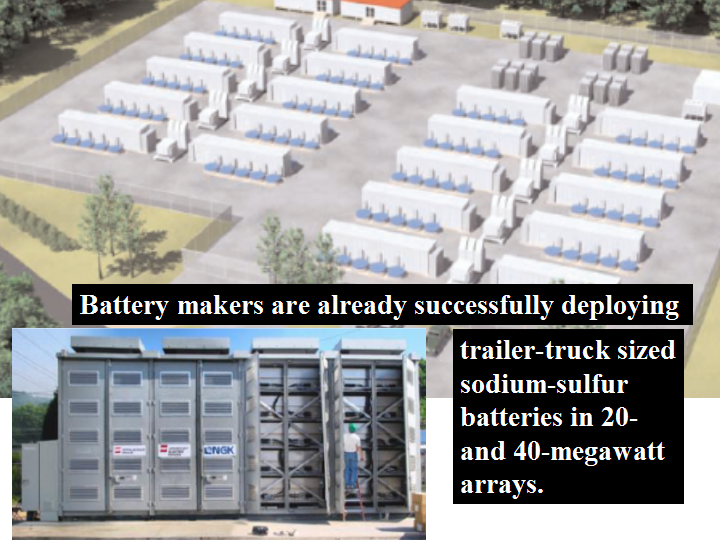 In April 2009, Walmart began purchasing energy directly from the Notrees project to power up to 15 percent of its stores and facilities in Texas…The total value of the 20-MW energy storage project at Duke Energy's Notrees site is $43.6 million. 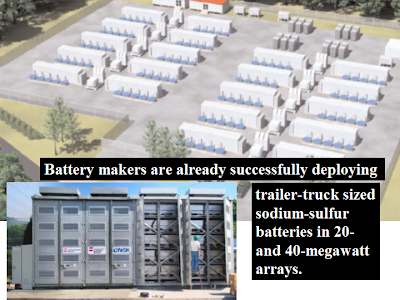 "The DOE grant was made possible by the American Recovery and Reinvestment Act of 2009… federal stimulus program…Duke Energy will work with the Energy Reliability Council of Texas to understand the project's implications and establish requirements for its implementation…The Electric Power Research Institute will provide advisory services…"
"Advanced lithium-ion battery maker EnerDel will enter the utility-scale energy storage market, supplying batteries for a major new [US Department of Energy] smart grid program…. 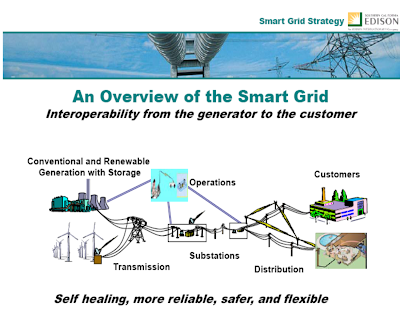 EnerDel will build the batteries for five one-megawatt power systems that will be used by Portland General Electric (PGE) - a pioneer in smart grid technology deployment -- to help manage peak demand and smooth the variations in power from renewable sources like wind and solar." 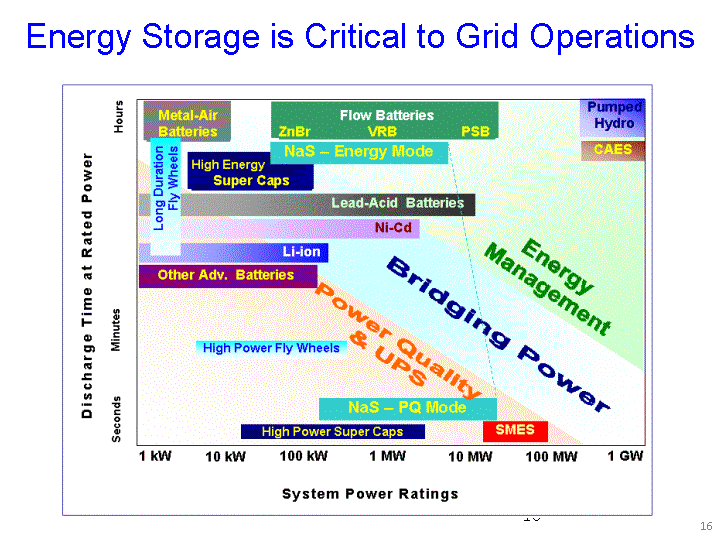 [Cyrus Ashtiani, Chief Technology Officer, EnerDel:] "Energy storage is a key component of the smart grid, as well as a crucial tool for enhancing both the reliability and the availability of renewable but often intermittent energy sources like wind and solar…We expect this sector to be a major growth area for the battery industry. This program is a breakthrough opportunity for EnerDel to prove the capabilities of our systems in partnership with one of the most innovative electric utilities in the country." 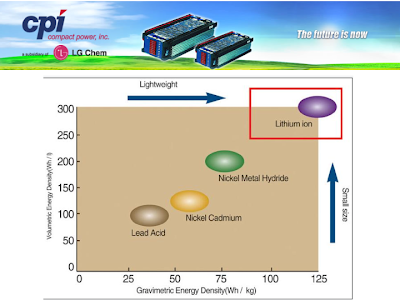 "Each of the five EnerDel battery systems will store enough energy to power roughly 400 average American homes simultaneously for up to an hour at a time utilizing the same core chemistry as the EnerDel batteries designed for the emerging new generation of plug-in hybrid electric vehicles. The new systems will be used in concert with a variety of both hardware and software solutions to improve system reliability during peak demand loads." 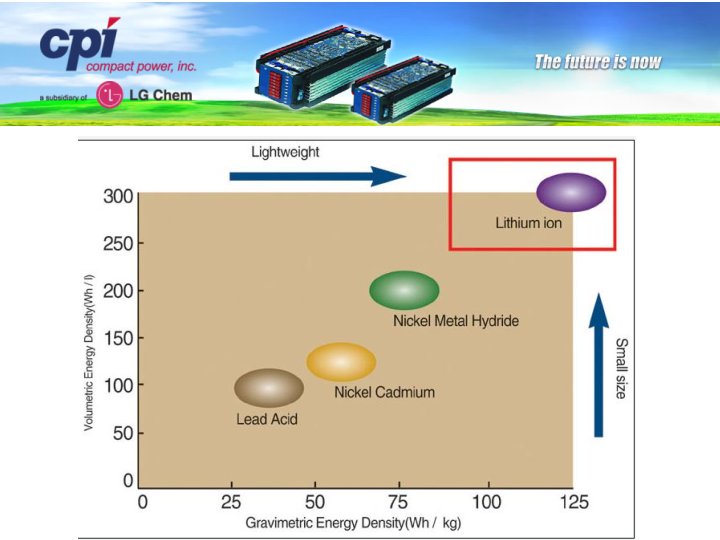 "EnerDel is part of Ener1…[which] has one of the most advanced lithium-ion battery manufacturing facilities in the world, and the only one of its kind in the United States…"
Before sitting down to stuffing (as a verb AND a noun), NewEnergyNews has, for the 1st time, a few expressions of gratitude to go with its 4th annual Thanksgiving post. - First, The American Wind Energy Association (AWEA). If the U.S. government was run as effectively as AWEA, victory in the fight against global climate change would be in the bag and the nation would not much longer be dependent on foreign or dirty energy. - Designer extraordinaire Phillip Garcia, who continues to be instrumental in the look of the page, despite the impossible things asked of him. - Hazel Henderson, Rosalinda Sanquiche and Ethical Markets Media, who for a long time helped buoy the fortunes and spirits of the page. If only everybody did business the way they do. - John Rabe, of Off Ramp at NPR-affiliate KPCC (89.3FM), for the opportunity to demonstrate NewEnergyNews’ media savvy. And Julian. - RenewableEnergyWorld, one of the world’s leading New Energy media outlets, for affirming the value of NewEnergyNews by bringing it aboard as a regular blogger. - Others in the media who have also acknowledged the page, including the Wall Street Journal and Mother Earth News. - The greatest readers and the most loyal patients any doctor with an obsessive/compulsive fixation on New Energy and a diagnosable addiction to writing could ever wish for. - Gorgeous, the Landlord, who has for too long carried an unfair share of the burden but can now, happily, free herself for newer, more wonderful things. - The brotherhood, especially Peter and Michael, the Akbar boys, especially RayBootCamp, the folks at both Kitchens and Kaiser, the Santa Clarita Horsewomen and their men, SpaceMan1, UniversalChris, Vinnie, Plynn and her Art Center Men and the North Country Firefighter, all of whom have shown loyalty, buoyed spirits and offered solace. - Finally, Lil’ Sister NFM and Frenchie. This page does not suffer from a lack of high quality readers but if the U.S. electorate was up to the standards set by those two, this nation would be ready to handle even the tough challenges it now faces. Deepest gratitude to you all and so many others from the bottom of NewEnergyNews’ old and weary heart. 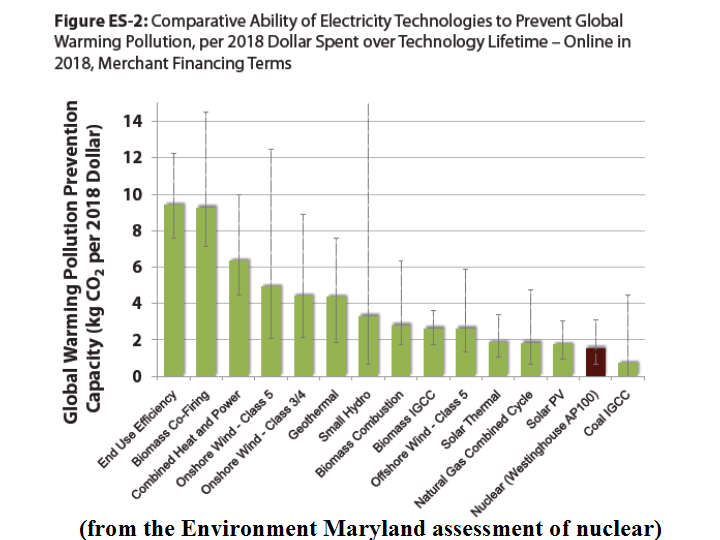 Expert evidence continues to accrue relegating nuclear energy to the category of “yesterday’s answer.” There is a move afoot in Congress to dramatically up spending for new nuclear energy projects. Bad idea. Look at the evidence. Don’t do it. 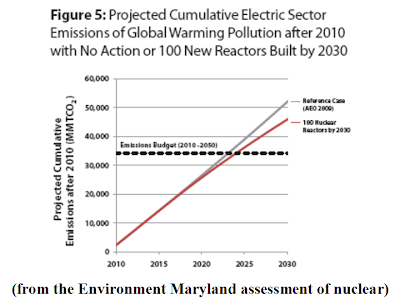 Generating Failure; How Building Nuclear Power Plants Would Set America Back in the Race Against Global Warming concludes that it makes no sense for the federal government to fund new nuclear projects that are prohibitively expensive, would be a burden on the environment and introduce a series of potentially irresolvable contaminating hazards. Directing the subsidies and policy preferences to the New Energies will deliver more affordable emissions-free power sooner with no serious irresolvable environmental consequences and no radioactive problems left for future generations to resolve. A recently introduced Senate bill would spend $20 billion over the next 20 years for ~100 new nuclear reactors to double existing U.S. nuclear generation capacity. It would also put U.S. taxpayers on the hook for an additional $100 billion in loan guarantees aimed at the historically unreliable nuclear industry. 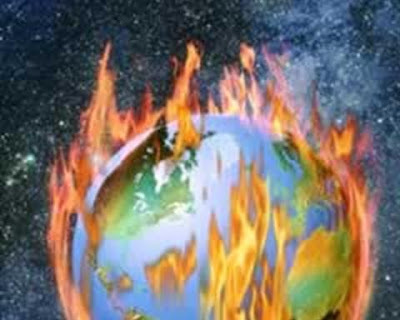 The result, the “Generating Failure” report demonstrates, would be a hampered U.S. effort against global climate change. 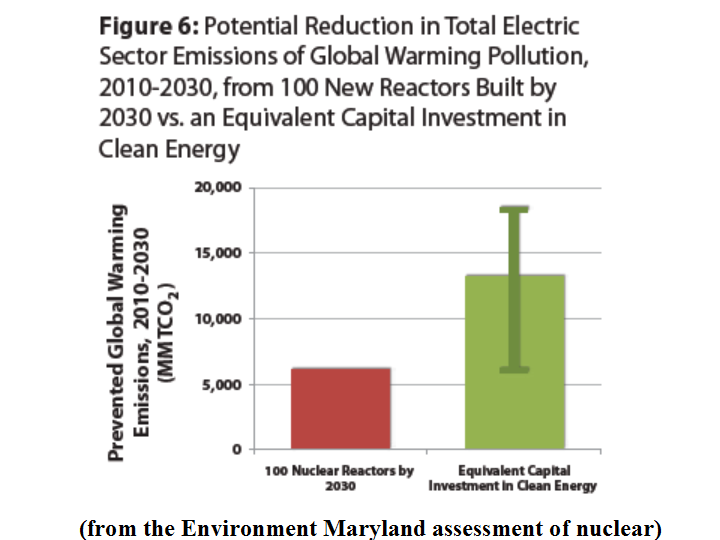 For the same capital required to build 100 new nuclear reactors, the U.S. could cut twice the greenhouse gas emissions (GhGs) by building New Energy (NE) and Energy Efficiency (EE). 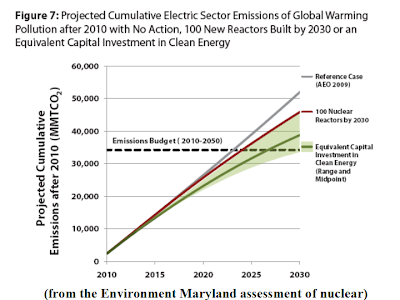 Given the GhG-cutting the U.S. needs to do, tying up $600 billion in up-front capital for 6, 8 or even 10 years in new nuclear reactors would be foolhardy. 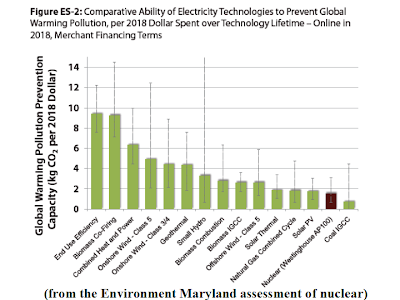 Per dollar of cost, EE and several New Energies are far more efficient at cutting GhGs than new nuclear, others soon will be – and the costs of the New Energies will fall farther while the costs for new nuclear reactors are expected to rise. First important point: “Generating Failure” begins with a simple assumption about global climate change: The need for action is pressing. 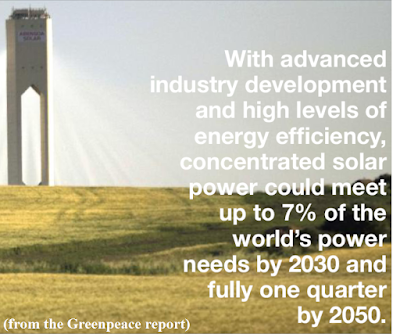 Action is urgently needed to cut GhGs. The sooner action is taken, the more choice and flexibility there will be in the kinds of workable action. The Science: A 1 trillion metric ton cut in GhGs offers a 75% chance of keeping average global temperature rise to 3.6 degrees F or less above the pre-industrial level. To do this, the United Nations Intergovernmental Panel on Climate Change (IPCC) says GhGs must be cut 25%-to-40% below 1990 levels by 2020. Where the easy solution is: The easiest big place to cut GhGs is at power plants. 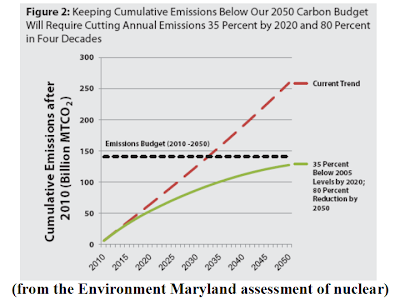 It is possible to cut U.S. power plant GhGs to a tight budget of 34 billion metric tons by 2050. 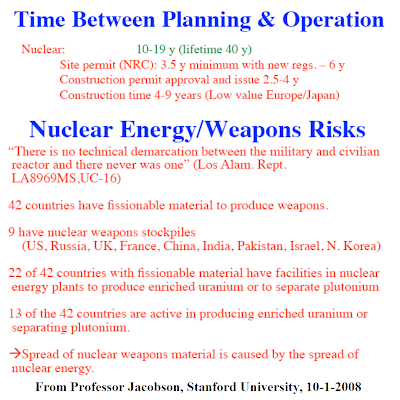 Next important point: It takes too long to build new nuclear reactors. By the time a new fleet of new reactors could come on line, the fight against global climate change would be nearly lost. 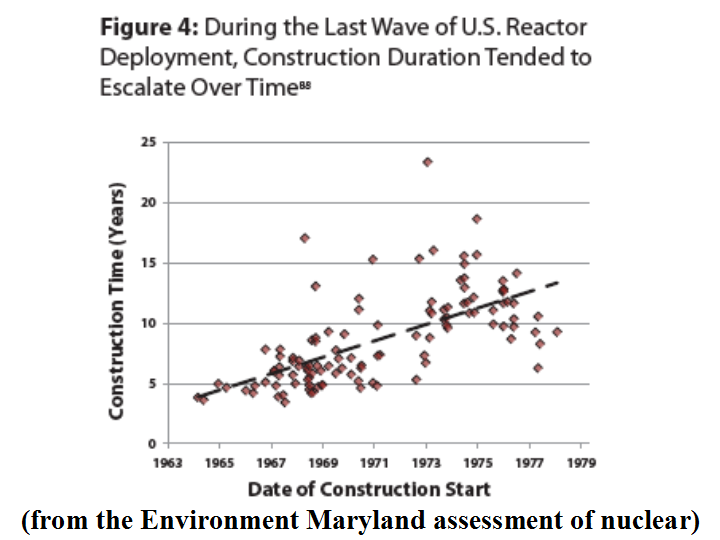 Because: No new reactors are now under construction (despite blessings and benefits bestowed by the 2005 energy bill). 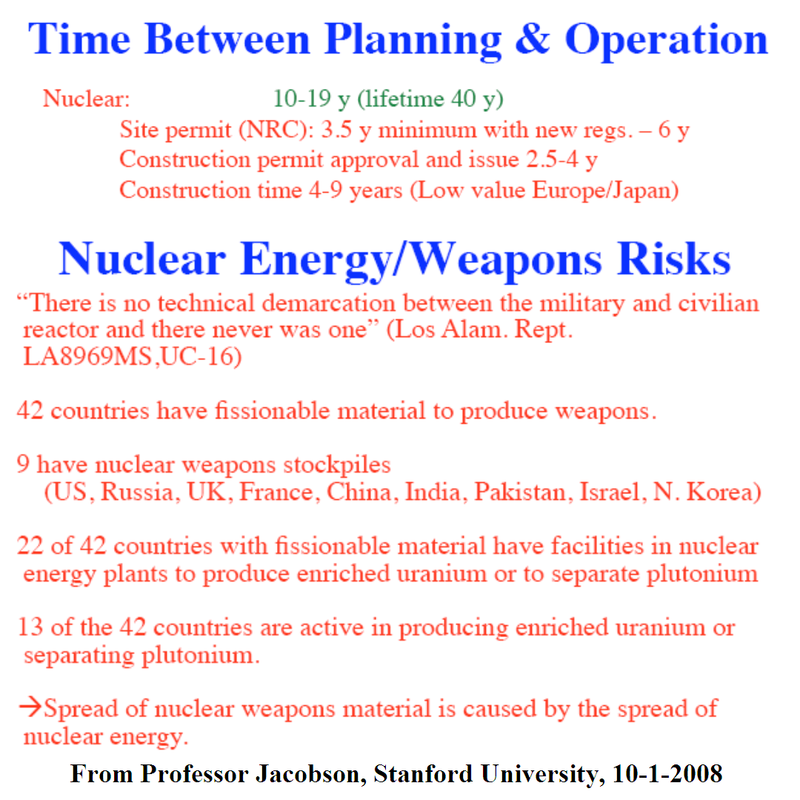 No new nuclear energy could be available before (optimistically) 2016, probably 2018. Because: The newest technology is being built in Finland and is 3 years behind schedule due to quality control failures (not something easily overlooked in a plant that uses radioactive fuel). 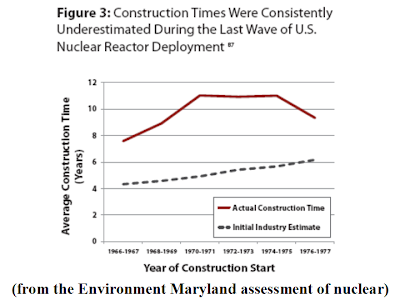 Because: The U.S. nuclear industry is not up to speed. It lacks people, experience and manufacturing infrastructure. 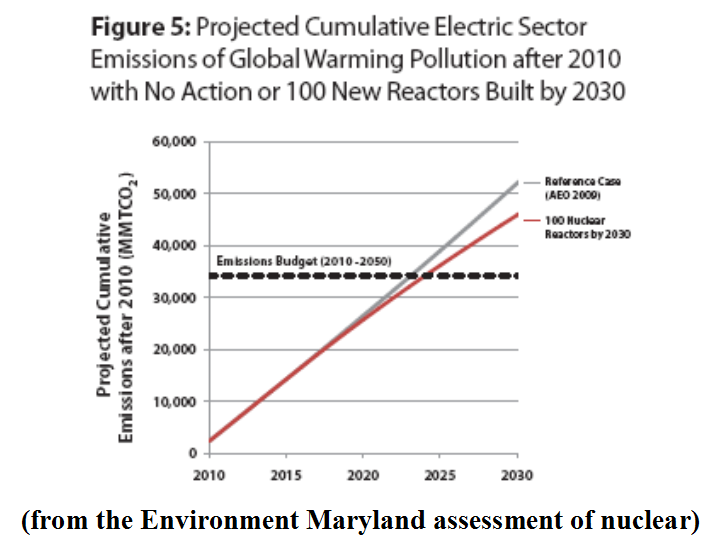 Because: If the U.S. nuclear fleet COULD be doubled by 2030,it would only cut emissions 12% and the U.S. would burn its 40-year budget of 34 billion metric tons of GhGs in 15 years. Third important point: New Energy (NE) and Energy Efficiency (EE) go to work cutting GhGs almost immediately. 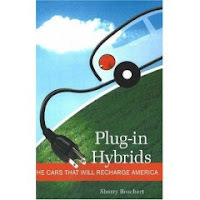 In states like California with advanced EE policies, emissions are already being cut 1%-to-2% per year. The wind industry is building the equal of 3 new nuclear plants every year, is just getting started and expects to provide as much of U.S. power in 2030 as nuclear despite inconsistent and sometimes disdainful policies. 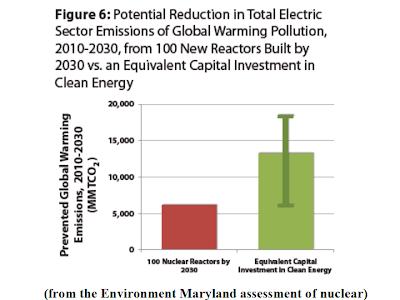 For the same capital it would require to build 100 new nuclear reactors, the U.S. could cut twice the GhGs building NE and EE – though that would not be enough GhG-cutting to beat climate change. 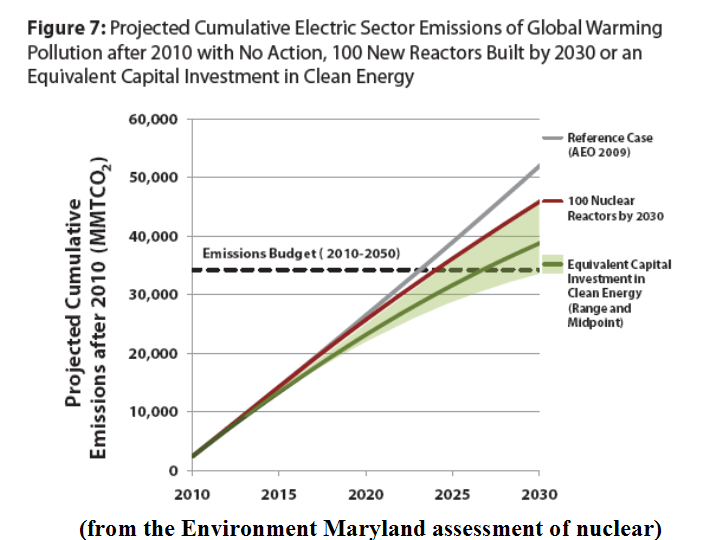 That brings up the fourth important point: Given the 40% of GhG-cutting the U.S. needs to do, tying money up in building new nuclear reactors is a terrible idea. 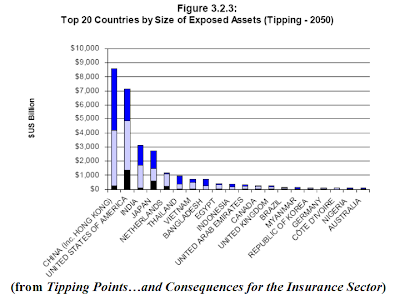 Every new reactor ties up $600 billion in up-front capital ($250 billion to $1 trillion) for 6, 8 or even 10 years. That is money that cannot be invested in NE and EE. 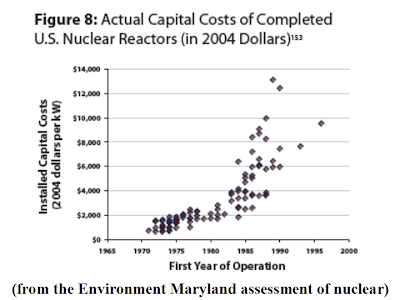 Power from a new reactor costs, over its lifetime, 12-to-20 cents per kilowatt-hour (or more). In contrast, spending on EE pays back (several times over) in reduced utility bills. The cost of electricity per kilowatt-hour from new NE projects is less than or comparable to new nuclear – but while the cost of nuclear-generated electricity is going up, the cost of NE-generated electricity continues to come down. Per dollar of cost, EE and biomass with combined heat and power are 5 times more efficient at cutting GhGs than new nuclear. Combined heat and power is 3 times more efficient. By 2018, land-based wind will be twice as efficient and offshore wind will be 30% more efficient WITHOUT production tax credit subsidies. Some studies show thin film solar photovoltaic (PV)-generated electricity to be presently comparable to nuclear. 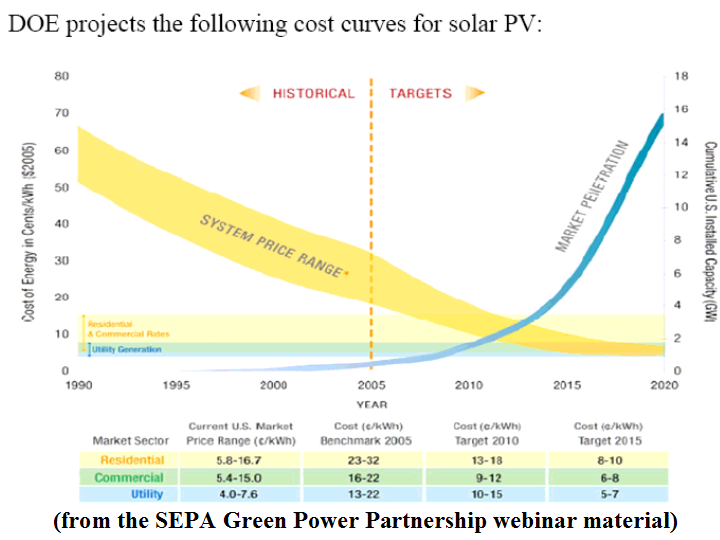 By 2018 (or sooner), solar PV will certainly be comparable in cost. Concluding important point: New nuclear power is not needed. 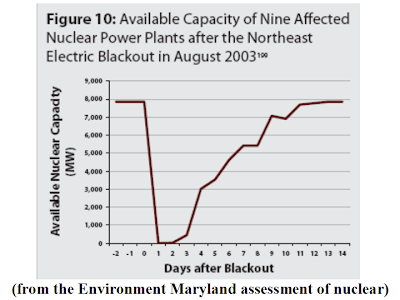 Much is made of the variability of NE and the “base-load” value of nuclear power by those who do not understand how NE variability is managed by grid operators and by those who do not understand what a terrible waste nuclear power plants create because they can only run at 2 speeds: Maximum and off. There are a lot of grid options, such as biomass, geothermal, stored NE and ramped up EE, that are available as full-time as nuclear. Other types of NE, like wind and PV solar, are 80%-to-90% predictable so that properly equipped grid operators can plan to use them without disruptions or complications. 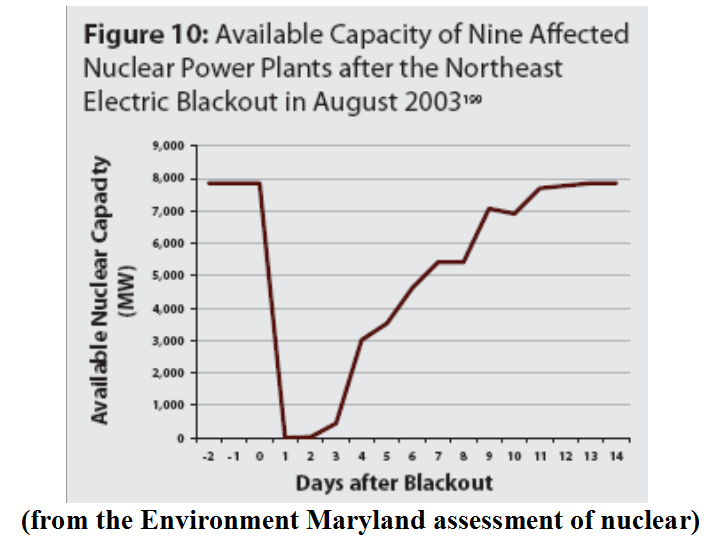 Over-reliance on base-load power like nuclear reactors is potentially more disruptive because outages are unplanned and quickly become uncontrollably massive. 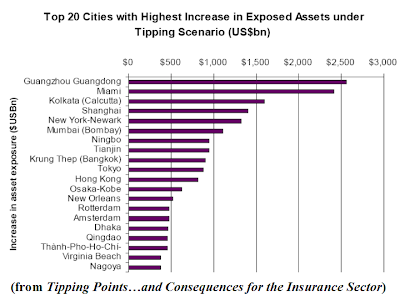 This results in huge extra costs in economic productivity and human loss. 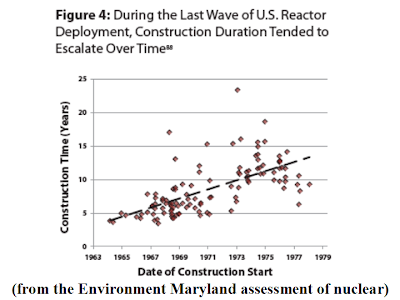 The inability to tune down a nuclear reactor’s output means its generation during off-peak periods is wasted. (1) Global climate change is best addressed by GhG cuts and the most efficient and cost effective way to cut GhGs is through NE and EE. 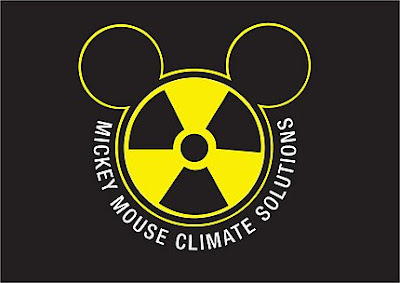 (2) Politicians should resist nuclear industry lobbying for more subsidies. 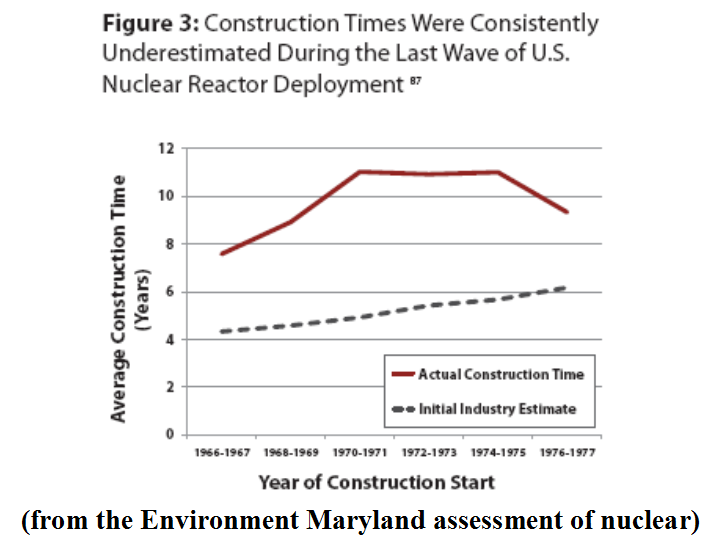 Despite $140 billion in loan guarantees and liability protections in the last 50 years, the nuclear industry continues to flounder. 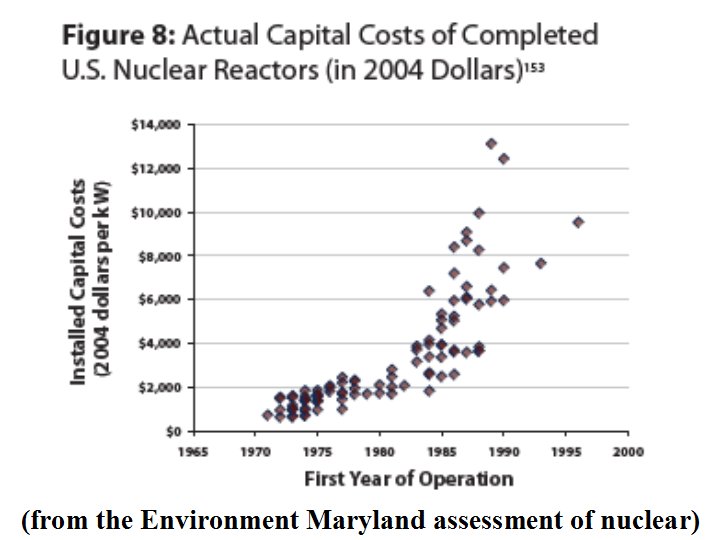 The numbers for nuclear energy prove that further federal investment would be throwing good money after bad. 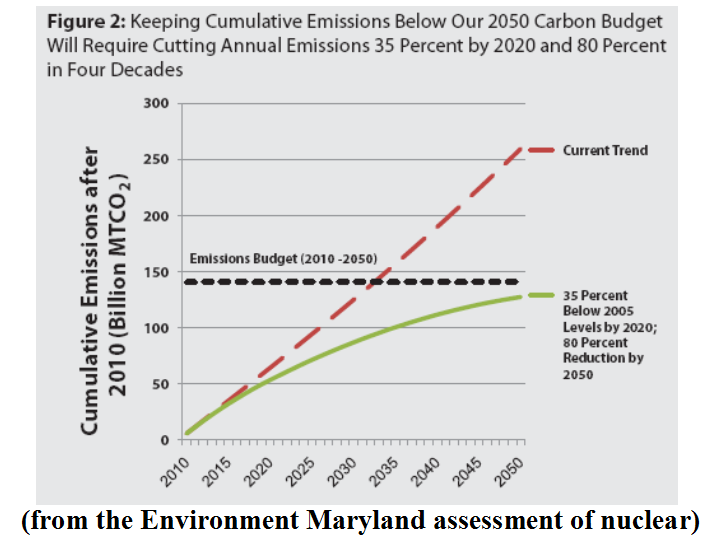 (3) The nation’s GhGs must be cut at least 35%-to-40% below 2005 levels by 2020 and 80% by 2050. To do this, political leaders must put a price on GhGs to make emitters pay for using the atmosphere. (4) The U.S. should, along with the international community, prepare to act to alleviate the unavoidable impacts of climate change. 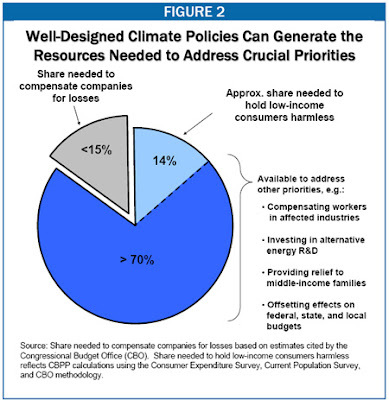 (5) There should be a national Energy Efficiency Resource Standard (EERS) requiring a 15% reduction in energy consumption by 2020 and a national Renewable Electricity Standard (RES) requiring regulated utilities to obtain 25% of their power from New Energy sources by 2025. (6) New appliance standards and building codes should aim to cut building energy use 50% by 2020 and get all new building to net zero energy use by 2030. (7) Spending should be directed not to new nuclear reactors but to new transmission and modern high voltage “smart” transmission that more effectively and efficiently carries and services NE and EE technologies.